A winter weather system has the region locked in its crosshairs. Winter storm warnings and advisories are posted for the region, with snow, sleet, freeing rain and rain all in the mix through Wednesday evening. Here's what to expect. 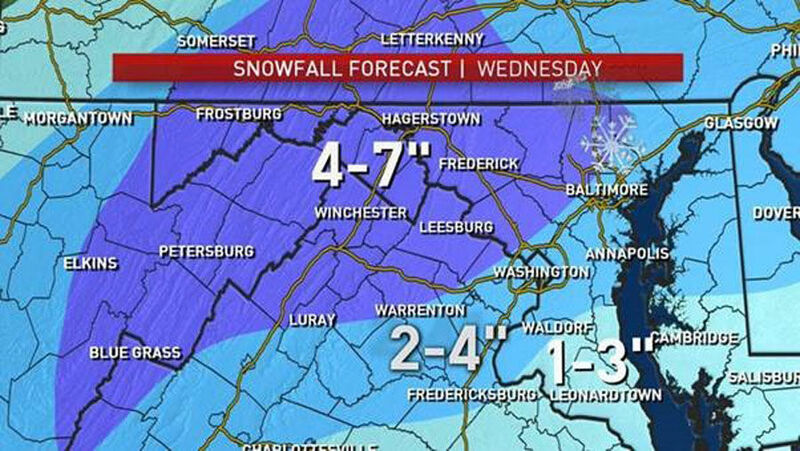 NBC Washington snow outlook for Wednesday. An eventual changeover to rain will keep totals somewhat in check, but when and where that happens will have a big impact on totals. WASHINGTON — Wet, wintry weather will arrive in the D.C. area just in time for the Wednesday morning commute. Expect up to 4 inches of snow around the District, and up to 7 inches in areas to the north and west. It won’t just be snow either: Around midday, snow will switch over to sleet and freezing rain and, then, just rain. Winter storm warnings and advisories are posted for the region, with snow, sleet, freezing rain and rain all in the mix through Wednesday evening. As a result, area schools have announced that they’ll be closed on Wednesday. Power outages are also possible. Once the first flakes start falling on Wednesday morning, it will stick immediately. It could be fairly icy through the middle part of the day before slushy conditions take over at night. Plan to stay off the roads, if you can — and with a chance for some icing from a brief period of freezing rain on top of snow or sleet, use caution walking on steps, sidewalks and driveways once the storm rolls in. Tuesday afternoon, Maryland Gov. Larry Hogan encouraged residents to stay off the roads if at all possible while crews clear them. A winter storm warning has been issued for the following parts of the WTOP listening area. Washington, D.C. from 1 a.m. to 7 p.m. Wednesday. In Maryland: Montgomery, Prince George’s, Anne Arundel, Howard, Frederick, Baltimore and Carroll counties from 1 a.m. to 7 p.m. Wednesday. In Virginia: Fairfax, Arlington, Loudoun, Prince William and Fauquier counties, including the cities of Alexandria, Falls Church, Fairfax, Manassas and Manassas Park from 1 a.m. to 7 p.m. Wednesday. A winter weather advisory has been issued for the following parts of the WTOP listening area. In Maryland: Calvert, Charles and St. Mary’s counties from 1 a.m. to 4 p.m. Wednesday. In Virginia: Stafford and Spotsylvania counties, including the city of Fredericksburg, from 1 a.m. to 4 p.m. Wednesday. A winter weather advisory means periods of snow or other winter weather will cause travel difficulties. Expect snow-covered roads and limited visibilities, and use caution while driving. A warm nose of air will move in aloft from the south to the north beginning midmorning, trying to erode a layer of cold air from the upper levels of the atmosphere right down to the surface. This warm air will inevitably win out, changing the snow to sleet and freezing rain, and finally to a plain, cold rain. How quickly this happens will have a big impact on snow totals. Cold air looks to hang on the longest from the Eastern Panhandle of West Virginia and Western Frederick County, Maryland, north toward the Mason-Dixon Line. This means these areas will have the potential for the highest snow totals across the region. Tuesday itself will stay dry, so the D.C. area can’t expect to see early dismissals or evening events canceled. The snow will begin moving in from the southwest to the northeast by daybreak on Wednesday. Lunchtime: Changing to a wintry mix. Dinner: Shifting to a cold, steady rain from south to north. In general, locations south and east will be the first to mix in with rain, while areas north and west will hold onto the cold air a little longer and end up with bigger snow amounts. D.C. and Baltimore can expect to see 2 to 4 inches before a transition to rain, with lesser amounts to the south and east, and up to 7 inches to the north and west. It could fall rapidly as well: “We could see snowfall rates of an inch an hour, and that would reduce visibility,” Storm Team4 Meteorologist Doug Kammerer said. 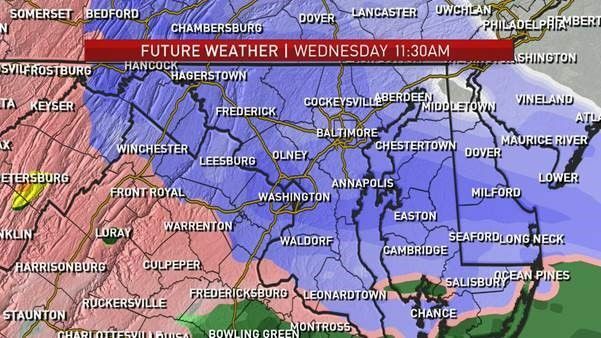 As of Tuesday, NBC Washington’s forecasters believe that warm air will start to spread north through the middle part of Wednesday, bringing some ice accumulation on top of the already-accumulated snow. “If you saw ice last week, you will most likely see freezing rain again this week,” Kammerer said during a Facebook Live Tuesday afternoon. “This storm will start out as snow for everyone, and several inches of accumulation are expected before milder air begins to change the snow over to a mix of sleet, freezing rain and rain,” Bell said. This process will begin to melt the snow into the overnight and turn into a slushy mess overnight Wednesday into Thursday morning. Rain showers will continue through at least the first part of Thursday as temperatures move into the 50s, creating additional melting. Tuesday night: Snow develops after midnight. Lows in the mid 20s to low 30s. Wednesday: Snow — heavy in spots — in the morning. Sleet mixes in around midday. In the afternoon: sleet, freezing rain and rain. By evening, rain with pockets of freezing rain to the north and west of D.C. Highs in the mid 30s. Thursday: Rain possible earlier in the morning. Clouds give way to sun. Highs in the 50s. Friday: Partly to mostly cloudy. Highs around 50. WTOP’s Will Vitka and Jack Pointer contributed to this report.